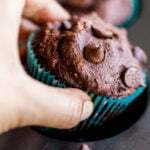 They are quick, easy and filling. Another breakfast which I very commonly make is Upma! 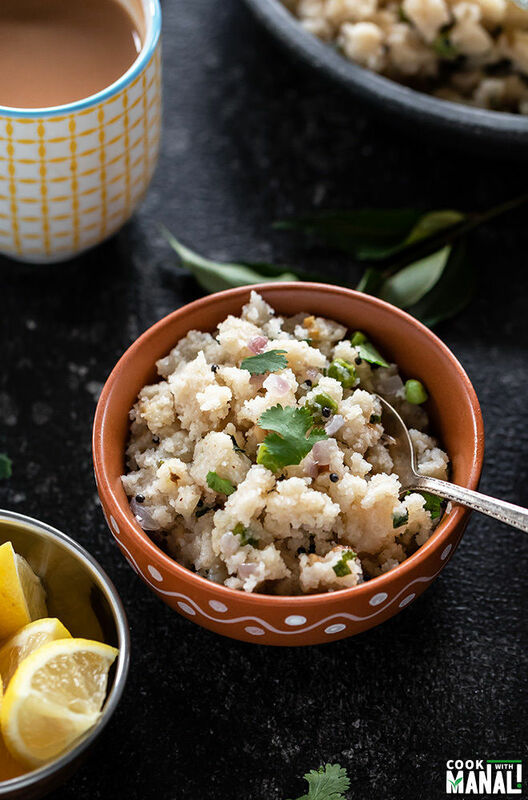 Upma is a traditional Indian breakfast made with sooji (also called rava in south). It’s more common in South India but now I see it just as much everywhere in India. My mom always said, upma is the savory version of sooji halwa, whhich is true in a way. They are both made with sooji and water. The difference is one has sugar and the other has veggies and salt. 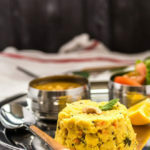 Rava Upma is often served with coconut chutney and filter coffee. I mostly eat it as much but of course the addition of chutney (& filter coffee!) makes it even more appetizing. I grew up eating upma for my breakfast. It was made at least once a week in my home and we used to eat it with ketchup! Sarvesh still eats it with ketchup. Anyway though I grew up eating it, I was never a huge fan. Of course I ate it happily but it was not something I would crave for. But now, I really like it! Now, it’s one of my favorite things to make for breakfast. Making upma is easy but I did struggle with getting the texture right for a while. Most of the time my upma turned out super dry. Basically it just never seemed like the one I would eat at South Indian restaurants and cafe. After a lot of attempts, I realized that it all lies in using the right sooji to water ratio. From what I learnt, almost everyone told me to use a 1:2 ratio for sooji to water. However it never worked for me. I wanted my upma to be soft and melt-in-mouth kind and for that this ratio didn’t work. What worked was a ratio of 1:3. So for every 1 cup sooji, I add 3 cups of water and it works perfectly well. 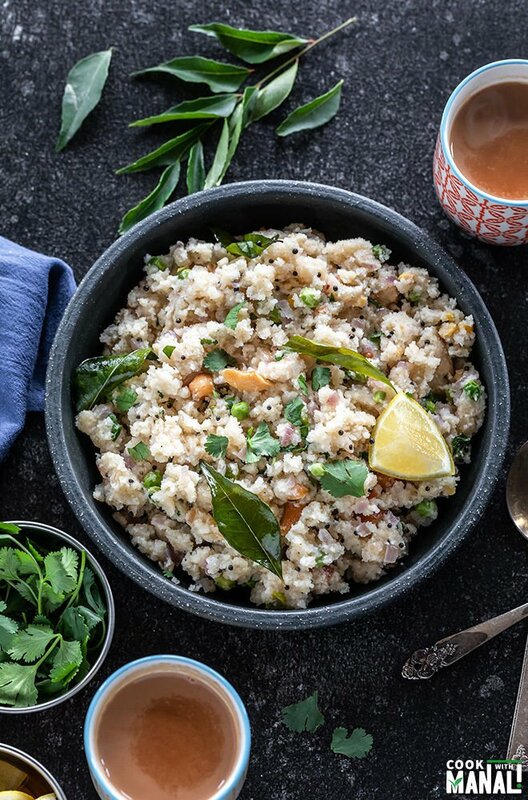 To make upma, you start by roasting the sooji until it’s fragrant. This is one step that you can do in advance and save time! So if you are planning to make upma this week, roast the sooji beforehand and keep it in airtight container. This saves you time in the morning on those busy days. Once sooji is roasted, the veggies are sauteed and then water and sooji are added to form a porridge like consistency. 1- Use 3 cups water for 1 cup of sooji- this results is soft consistency like you get in restaurants. I have tried 2 and 2.5 cups, but I think 3 cups works best. 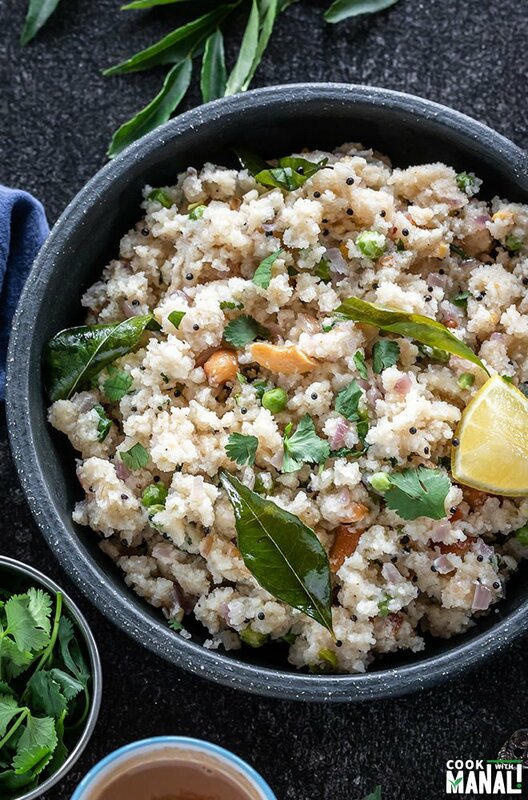 2- Use ghee and oil more freely for this upma recipe. 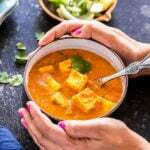 I have used 1.5 tablespoons oil, you may use even more for a softer and tastier upma. I also add a teaspoon ghee in end to enhance the flavors. 3- Add lots of veggies for a delicious upma. I added only peas, You can add peppers, carrots. My mother-in-law also adds cauliflower (cut into very small pieces) and it tastes good. 4- Do not add all the sooji to the water in one go. Add 1 to 2 tablespoons at a time, stirring after each addition. This way the upma will not form any lumps. 5- Serve straight away when warm. It tastes best when fresh. 6- Don’t forget the squeeze of lemon juice- really helps in bringing out the flavors! 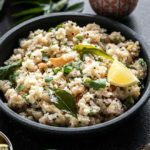 The final texture of upma also depends on the type of sooji that you use for the upma. 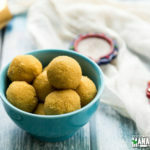 So if you are not happy with the texture even after following all these steps, try going for a different brand of sooji. 1- Roast sooji on medium heat until fragrant, around 5 to 6 minutes, stirring continuously. Sooji shouldn’t turn brown from bottom so be careful. Remove sooji from pan and transfer it to another bowl. 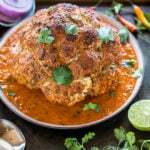 You can do this step of roasting sooji in advance and save time for busy mornings. 2- To the same pan now add 1.5 tablespoons oil on medium heat. Add mustard seeds and let them pop. 3-Then add hing, cashews, chana & urad dal (which I soaked in water for 10 mins), ginger and saute for 1 minute until they start changing color. 4- Add onion, green chili and curry leaves. Cook for 2 minutes until the onions are soft. 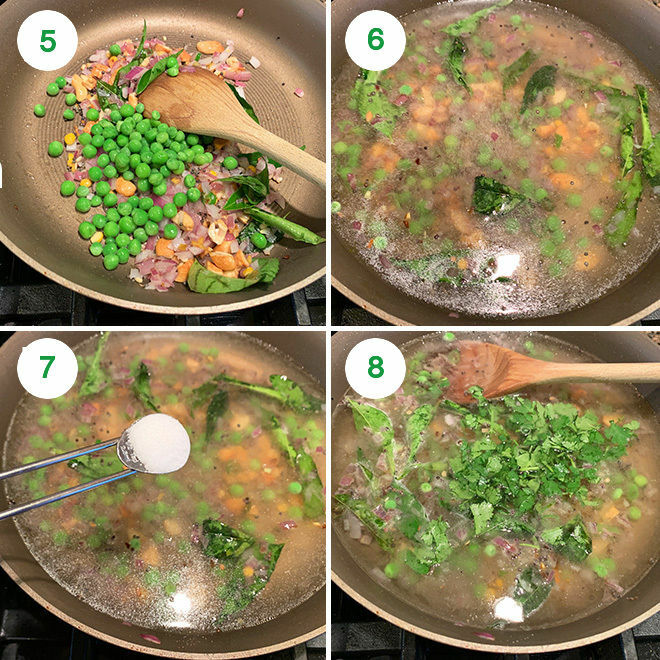 5- Then add the green peas and stir (I used frozen peas and soaked them in warm water for 10 mins before adding to the pan). Cook for 2 minutes until the raw smell of peas goes away. 6- Add 3 cups of water. 7- Then add salt to the water. 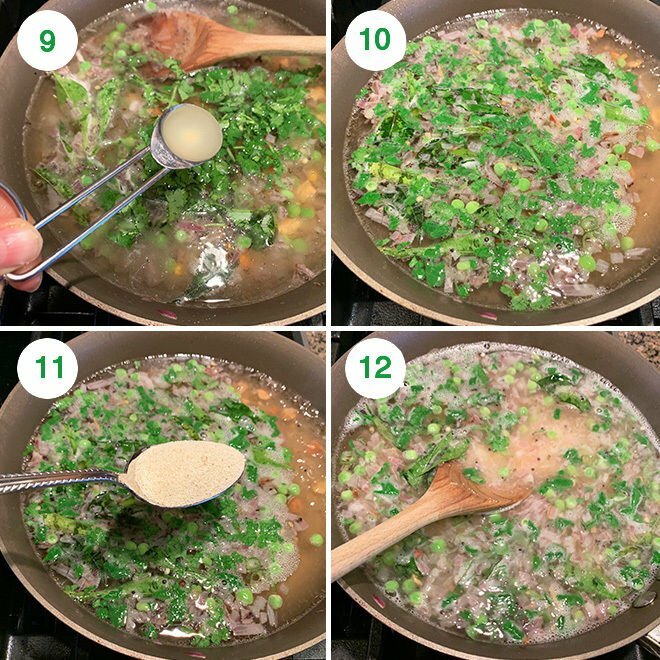 8- Also add the chopped cilantro. 9- Add lemon juice and mix it well. You may also add sugar if you like little sweet taste in your upma. You may add 1/2 teaspoon sugar. I did not add any. 10- Now let the water come to a boil. 11- Once the water comes to a boil, start adding the roasted sooji little at a time. 12- Mix sooji after each addition in one direction with a wooden spatula. 13- Add all the sooji in similar way, little by little until all of it is absorbed by water. 14- Then cover the pan with lid and set heat to low. Let it remain like that for 2 mins. 15- Remove lid and add 1 teaspoon ghee. This is optional but recommended. Turn off the heat. 16- Mix the ghee and close lid again for few seconds. Remove the lid, fluff upma with a fork. 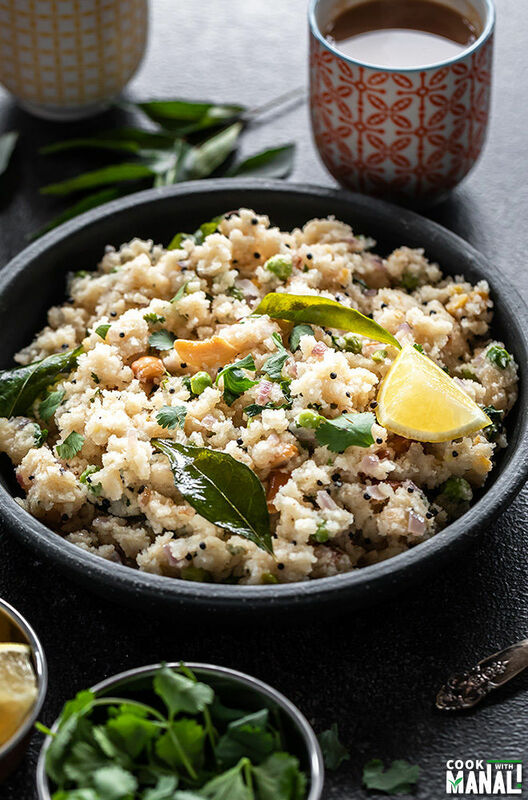 Serve upma warm with a side of coconut chutney! 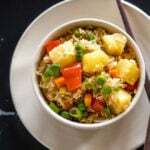 If you’ve tried this Upma Recipe then don’t forget to rate the recipe! You can also follow me on Facebook, Instagram to see what’s latest in my kitchen! 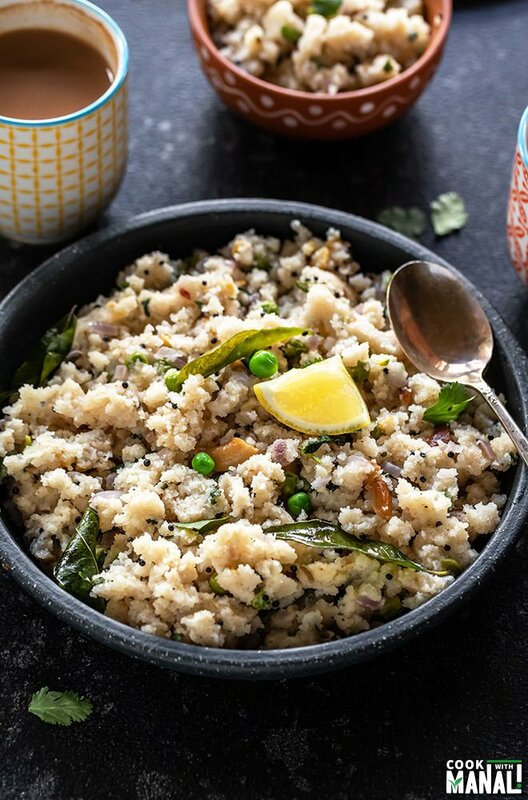 Popular Indian breakfast Upma is a savory porridge made with semolina, water and veggies. 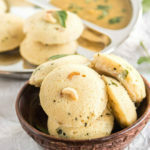 It's a filling and nutritious meal and tastes great with a side of coconut chutney. Roast sooji on medium heat until fragrant, around 5 to 6 minutes, stirring continuously. Sooji shouldn't turn brown from bottom so be careful. Remove sooji from pan and transfer it to another bowl. To the same pan now add 1.5 tablespoons oil on medium heat. Add mustard seeds and let them pop. Then add hing, cashews, chana & urad dal (which I soaked in water for 10 mins), ginger and saute for 1 minute until they start changing color. Add onion, green chili and curry leaves. Cook for 2 minutes until the onions are soft. Then add the green peas and stir (I used frozen peas and soaked them in warm water for 10 mins before adding to the pan). Cook for 2 minutes until the raw smell of peas goes away. Add 3 cups of water. Then add salt, chopped cilantro and lemon juice and mix well. You may also add sugar if you like little sweet taste in your upma. You may add 1/2 teaspoon sugar. I did not add any. Now let the water come to a boil. Once the water comes to a boil, start adding the roasted sooji little at a time. 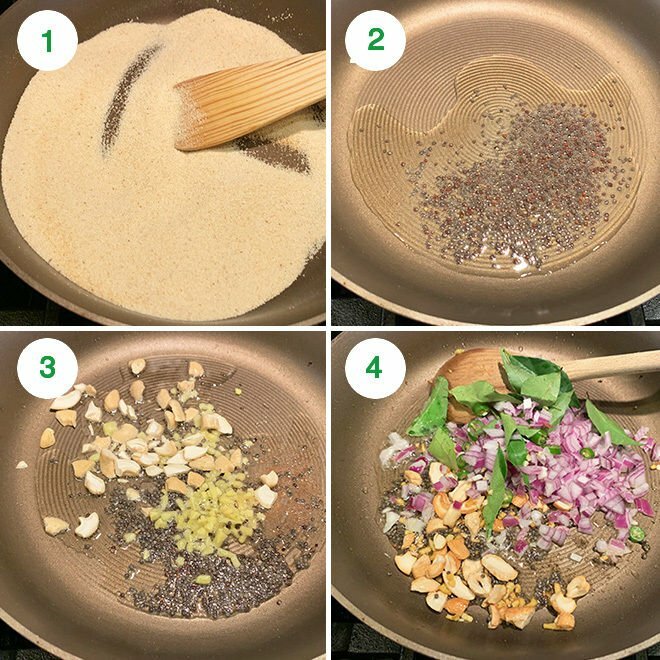 Mix sooji after each addition in one direction with a wooden spatula. Add all the sooji in similar way, little by little until all of it is absorbed by water. Then cover the pan with lid and set heat to low. Let it remain like that for 2 mins. Remove lid and add 1 teaspoon ghee. This is optional but recommended. Turn off the heat. 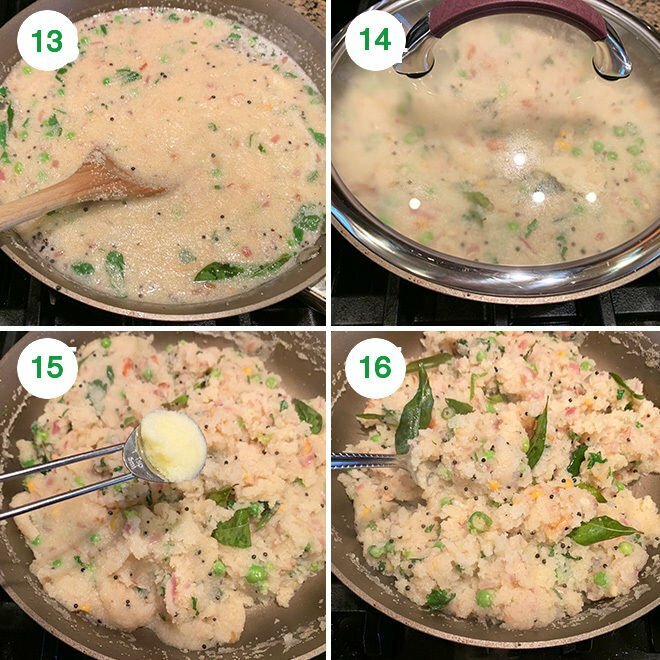 Mix the ghee with the upma and close lid again for few seconds. Remove the lid, fluff upma with a fork. 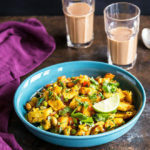 Skip the ghee at the end to keep it vegan. Thanks Angie! It’s very good! So simple and so delicious. Finally got the consistency I was looking for… love your blog! Thanks Rasika, glad you liked!